It seems like a recent phenomenon to look at a lot of the tropes of fantasy literature & criticize them for being elaborate Eurocentric fables about colonialism. The blonde haired, blue eyed hero wades into the dungeon filled with swarthy barbaric orcs! Or you know, the white colonist invades the home of the indigenous peoples & wipes them out in a fit of genocide. Same sides of the coin. The thing is, M.A.R. Barker was there first. M.A.R. Barker was there almost at the beginning of Dungeons & Dragons; he was there when Arneson & Gygax were still putting the whole thing together. M.A.R. Barker is typically compared to J.R.R. Tolkien, & not just because they both start with three initials. Professor Barker's world of Tékumel has its seeds in language, just like Professor Tolkien's Middle Earth. The difference here is that while Tolkien drew on Scandanavian & European roots for his languages, Barker went to Southeast Asia & South America. He carried that logic through to the rest of Tékumel, fashioning cultures & fashions from a wide variety of non-Western sources. Tékumel is a land of varied kingdoms, classes, races, & species, each level of which interacts with the other to form a complex organic whole. Tékumel is Science Fantasy. That is, at the far distant root of the setting lies Science Fiction-- space ships & aliens. That is long since gone to dust-- the occasional artifact exists to be found, but largely the technology of the past is moot. The planet of Tékumel is absent of most heavy metals & terran animals; horses & iron have given way to foot traffic & weapons of animal chitin. Most sentient species besides human are treated like outsiders-- with speacies like the insectine Pe Choi replacing human-friendly species like elves. There are a few "inimical" species that hate the humans relentessly, predominantly the cinnamon-goo Ssu & H.R. Gigeresque Hluss. See, they lived on Tékumel before the humans came & terraformed it; they are the displaced peoples whose world was ruined & poisoned by the colonial species. Besides all that, Tekumel is now home to a range of psychics & magicians, & worse things too: the undead, extraplanar demons, & god-things. A few of the latter divinity-like creatures have been sanctified by pacts with the humans & are worshiped as gods: Lords of Stability & Lords of Change. Each of which is a blending of pulp traditions of the best sort with M.A.R. Barkers atypical eye for multiculturalism. High action meets political intrigue; the game of kingmaking blends into adventure & exploration. Weird events transpire & the non-Western traditions are dealt with in such a matter of fact way that soon the castes & customs of Tsolyáni become second nature to the reader. The Noble Action of even the villains is understandable in context. M.A.R. 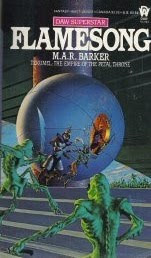 Barker doesn't get the attention he deserves; he's a modern legend, an overlooked master, & I highly recommend him. The first two books, Man of Gold & Flamesong are DAW books that are out of print, but they are easily gotten (cheap!) from online vendors; the latter three are available from a small press called Zottola.